“I traveled all my life to places most will never know. He's ventured so widely that if you ask him where he's from, the most accurate answer is “lots of different places.” The pages of his dogeared passport could fill a book. But Scott's not far from the sea, working as a consultant for the ocean freight business. He provides Canadian logistics management and trouble-shooting for the Dutch shipping company W.E.C. Lines. Scott brings his wealth of world knowledge and global sailing to the table, ensuring consumer goods make it from point A to B in the most expedient way. And that can be a challenge on today's busy shiping lanes. Scott pointed out that some 90% of the world's trade is done by sea. A new super freighter, reported to be the largest container ship in the world, can carry 18,000 20-foot containers. Yet, despite touching three oceans, in Canada the bulk of our trade is shipped by road throughout North America. The cargo is precious, whether it's a new blend of tea from Kenya or refined iron ore headed for China. Major shipping hubs are like busy international airports, handling thousands of containers each day. The most challenging part, Scott says, is staying on top of each and every one. Computer failures and weather can wreak havoc on shipping schedules. “But now my life has changed, I seldom travel fifty mile. Scott's current lifestyle is a far cry from his four decades as an “experiential traveller,” circumnavigating the globe twice, visiting 70 countries and territories and sailing all but two of the world's oceans. His seafaring life began as a boy in a fishing village in the south of England. At 15 and a half (the minimum legal age) he joined the British Naval Reserves and served in the Merchant Navy until he was 22. Bitten by the travel bug, he spent 38 years travelling the globe, in an “unsettled” life with no permanent resident status. And that suited him just fine for most of those years. One of his favourite places is Saint Helena, a British Overseas Territory in the South Atlantic, one of the most remote islands in the world. There, Scott met Jonathan, a now 181-year-old giant tortoise, reported to be the oldest living animal on earth. Near and dear to his heart are the British Virgin Islands, the current home to Scott's two youngest children who were born there. He skippered yachts and charter boats in and around the Caribbean for roughly seven years in the 1980s. He recalls with fondness piloting the likes of business magnate Sir Richard Branson and actor John Hurt. Scott was also first mate on a 148-foot yacht that was once owned by Richard Burton and Liz Taylor. He quite enjoyed his stint skippering a 110-foot powerboat owned by Italian politician and tycoon Berlusconi. “Those jobs were fun, but since coming ashore, work has become more a necessity,” he said. Being a “boat bum” meant living out of a duffle bag and often heading off to find the next place as soon as a little money was earned. Yet he's been very lucky in his life, always seeming to stumble into or earning jobs, or creating his own niche. “It's been wonderful,” he said. School may have provided him with the basics in life, but his real lessons were learned by travelling. “Please, sit beside me traveler of the road. I'd like to share some lessons that I've learned. There's some that life, unasked for, freely showed. The freedom of the open sea is unparalleled, but Scott admits that he suffers from seasickness. He's experienced terrible storms and hurricanes; was caught up in the bush war in Rhodesia (now Zimbabwe); had his appendix out in a maternity clinic in Antigua; danced with a Brazilian carnival procession and dove for sunken treasure. He's heard stories of billions of dollars worth of platinum resting on the ocean floor and met treasure hunter Mel Fisher (who discovered the Spanish galleon Atocha) and Jean-Michel Cousteau (son of famous ocean explorer Jacques Cousteau). He was shipwrecked in Portugal for several months. Nothing has deterred him from venturing onward. Has he been scared? Of course. He freely admits he's not brave, j ust curious. 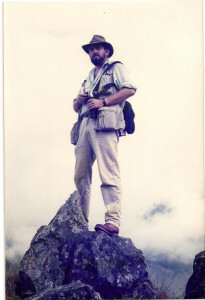 That curiosity led him to the Inca trail in Peru, where he was attacked by a rattlesnake. One of the most breath-taking moments was sharing a sunrise with his partner in the famous mountain village of Machu Picchu. There, as well as on the African savannah and on the ocean several times, Scott said he's gotten this feeling that that was where man belongs. It's akin to being one with nature and just soaking in all that pure energy. This sense of belonging in the natural universe is almost spiritual in nature. Feelings like this are never experienced in the modern urban “jungle,” he points out. He prefers to be called a “traveller” since he absorbs as much of the local culture as he can during his travels. “Tourists” take with them as much as they can from their own culture. The self-proclaimed “tree hugger,” who grows much of his own food, knows about connecting with nature and stresses we have to change our attitude towards this planet. Humankind has caused a great deal of damage and this needs to change. While he may not have all the answers, he concurs with some aboriginal beliefs that this life is merely a stepping stone. Scott has attempted to capture the flavour of his life's journeys with a series of books, Wanderings and Sojourns, containing stories and poems along with plenty of insights. These are not memoirs, but entertaining anecdotes written to get the reader thinking. Another in the series is on its way, as well as an illustrated children's environmental book, and the prolific writer hopes this passion will take him through his golden years. For more on his writings, visit www.caridiangroup.com or email him at caridianpress@hotmail.com. Scott has been active in King, acting as MC or moderator for business events and political debates, helping out with Cold Creek, Arts Society King and with junior rugby programs. King is by far his longest inland home. To ride on each current and wait on each tide. Jim Scott may have found a comfortable berth in Nobleton. But he likely glances out the window from time to time, longing for salt water. Perhaps he'll return one day.